The living room has a 32 inch TV, and a great library of books and games. the nook is the sort of place that makes you feel great as soon as you enter. 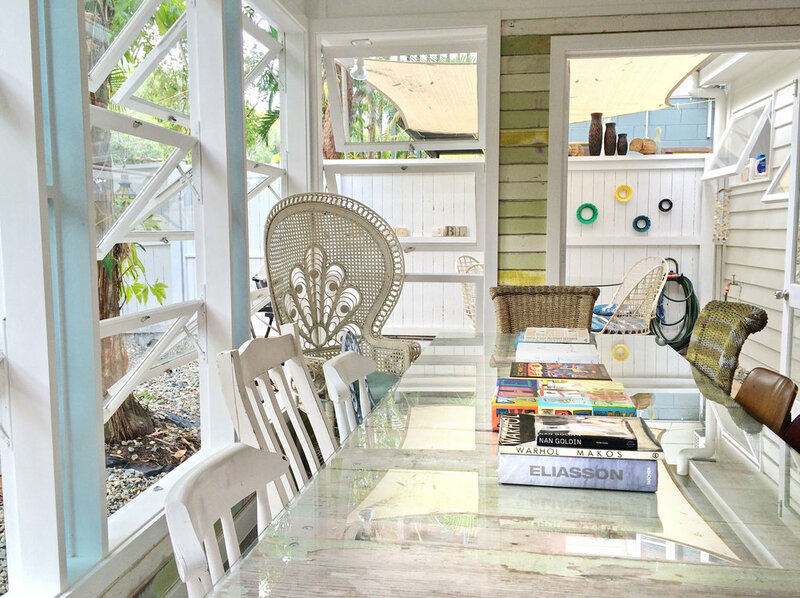 beautiful and fun artisan beach house with everything you need! Highly recommend! The Port Douglas Artists' Nook is our new two bedroom holiday rental in the heart of Port Douglas, Far North Queensland, Australia. It is right beside our popular three bedroom holiday rental, The Artists Treehouse (sleeps six). So if you would like to share your holiday with more family and friends, book both the properties! 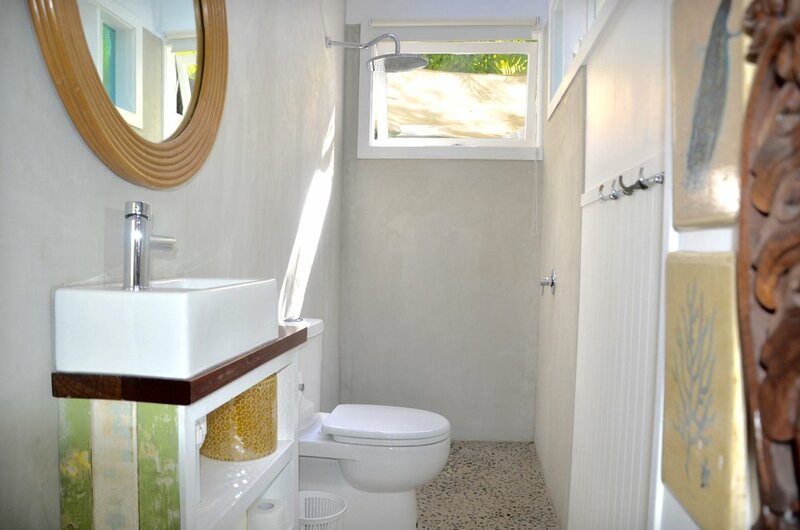 The Port Douglas Artists' Nook features two bedrooms (sleeping up to four), opened planned living room and dining area, two bathrooms, decked garden sitting area, courtyard area leading to shared pool. Filled with major collections of inter/nationally renowned artists, an amazing book collection, polished concrete floors, eclectic furnishings, the Port Douglas Artist's Nook oozes charm and cool vibes, and most importanly, makes you smile as soon as you enter. The Nook suits families and friends looking for comfort, of being in the heart of Port Douglas, so you can walk anywhere. The Artists' Nook is tropically styled to capture the sea breezes and light. It has an open plan fully equipped kitchen with all you should need to make the perfect dish. The kitchen has an electric stove and dishwasher, toaster, juicer, blender and other appliances. This opens to the dining areas featuring a bespoke table with settings for eight people. Polished concrete floors, funky lamps, French doors lead to an outside deck and entertaining area with weber bbq.The living room has a leather couch with a 32 inch flatscreen TV, DVD player, selection of DVD's, and digital television. There is a stereo with iPod/iphone attachment. The master bedroom has a queen size bed. The room features french doors that open to the back courtyard, capturing the seabreezes. Their is an ensuite with shower/ toilet. The bedroom has a flatscreen TV and ample cupboard space. The second bedroom also has a flat screen TV and DVD player. can be set up as king or two singles. French doors open up to the back courtyard. The back gate leads to the pool. The pool is shared with eight other properties, however, most are residential so the pool is rarely used, and its most likely you will have it to yourself. There are chairs/toys/spades/boards/rugs/towels to take to the beach. The Artists Nook does have wireless internet. The Artists' Nook fronts onto a quiet street, looking over towering paperbark trees, giving it a secluded and serene feel. The Artists Nook is situated next to the Artists' Treehouse, (our three bedroom holiday rental) in the heart of Port Douglas, you can stroll into the main street in about eight minutes, or take a walk over to the beach, just a few minutes away, so hiring a car is not necessary unless you want to explore the region. On the main street you can find a great supermarket with all you should want, a selection of Australia's best restaurants, some cool cafes and a great selection of boutiques. The beautiful Fourmile beach is perfect for long morning walks, is wonderfully safe for swimming, bike riding, sunning or kite surfing. Do you feel like heading to the reef? The marina is about eight minutes walk way. A large selction of boats head out to the reef to dive, to snorkel and to fish. The marina also has a few restaurants and shops. If you don't feel like walking to town, just near to the Artists' Nook is a selection of cheap restaurants and takeaways, an alcohol shop and cake shop. With plenty of sunshine, beautiful warm seas, refreshing sea breezes and a warm climate all year round, Port Douglas weather is always wonderful. Winter (Dry season) starts in May and finishes in October offering sunshine, fresh breezes and relatively low humidity. Summer is quieter, extends from November to April and refreshes the region with incredible tropical afternoon downpours, abundant tropical fruit, and less people. This is a spectacular time of year. The tropical vegetation is abundant and the forests are filled with clear streams and many waterfalls to cool off in. Ocean water temperatures range from 23 degrees Celsius in July to 29 degrees Celsius in February. Thanks to the beautiful Port Douglas weather you can swim all year round. The 'best' swimming season runs between April and October. Between the months of November and March, Port Douglas is home to the box jellyfish, so special swimming enclosures are erected at Fourmile Beach to protect swimmers. Definitely book direct to avoid 20 percent service fees of booking agents. Fill out the form below and I will answer your email ASAP. High Season dates: Christmas, Easter, 1st May to 1st December. At the Artists Cottage, we have a seven night minimum in the High Season. Our rates are $265 per night. Low Season dates: Late January, February, March, April (except Easter), November, Early December. At the Artists Nook we have a five night minimum in the low season. Our rates are $195 per night. Bookings must start on the day the previous booking leaves, so do get in touch before booking flights. We often do long term stays over this time, just get in touch for a great rate. Payment is a twenty percent non refundable deposit and a non refundable balance two months before arrival. We strongly advise travel insurance as a lot of life happens while making holiday plans. No smoking inside, no shoes inside. This is a residential block, not a resort. Please don't use pool at night, or if you are using, please be quiet. This is a residential block so please be aware of our neighbours and don't make loud noise in the complex. Thanks so much for enquiring about the Artists Nook in Port Douglas- the first step to an amazing holiday in Port Douglas. We will be in contact shortly.